I’ve had enough of cubicle life , or in my tiny town in the last 2 months. I desperately needed a break to burst out and rejuvenate myself. This Memorial day long weekend gave me the time & opportunity to do it. 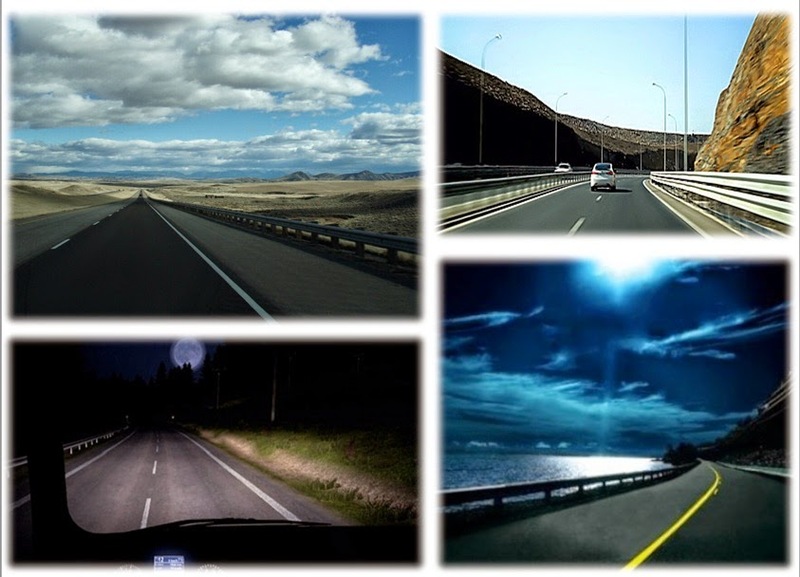 Four of us (Me, Muthu, Ravi & his family) planned for an outing – Road Trip to Kentucky!!! . My first ever trip in the US !. “WHITE WATER RAFTING at CUMBERLAND RIVER” was the stirring vigor which made the trip to happen. Our trip started on the Friday evening; We left a bit early from office (trying to avoid the long weekend traveler rush) and picked up a BIG car for our trip. 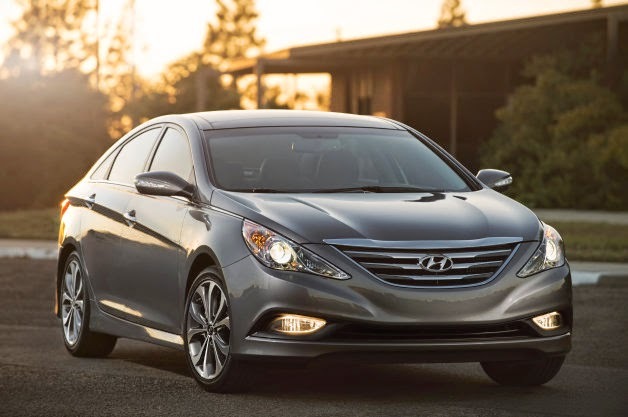 Almost a brand new, Hyundai Sonata joined us, as the 5th member of our team; he gave us an excellent company and enjoyed the complete 3 days trip with us. Our trip was from Ft.Wayne,Indiana to Corbin,Kentucky thro Cincinnati,Ohio. We clicked the “shortest route” in our GPS device which took us through some of the bad roads of the United States ; full of cracks & potholes and it was a bumpy ride till we hit the Interstate -75 Highway. Resumed the drive around 5PM, again on Interstate-75. The scenery on both sides of the road was remarkable and we passed through large Mountains, fields, canals ,rivers and gorges. The hilly roads to Kentucky were so green and enchanting as they always are. The drive had turned pleasurable. Music, talking, laughter, and snacks were the norm till we halted for dinner at – Mexican Restaurant, Cincinnati. Late evening drive on the Kentucky roads was wonderful (that too... on a full moon day), excellent!!! ; I just loved it. We finally reached our destination in Corbin,Kentucky around 1.30AM (late night) and were ready to doze off. however, the beautiful views kept us awake for quite a long time. Still the excitement over next day’s rafting didn’t leave us asleep. With all excitement, we woke up early in the morning, got ready for the rafting. After signing certain disclaimer documents, we were made to watch a 15mintues safety Instructions video. It made us completely nervous and scared!. We were dressed up with all safety PFDs and Helmets; got our paddles and headed towards the Cumberland falls. On the banks of the Cumberland River, We were again told other set of safety instructions and experiences. We’re absolutely panicky. Just below the high and mighty Cumberland Falls, is Cumberland River put-in for the whitewater rafting. Our guide, Max instructed us to paddle into the river, and leaded towards the mighty falls!!!. We enjoyed the beautiful view of the falls at put-in, before we paddle downstream into the waves of whitewater. First 5 miles of the trip was the peak of excitement; through Class II & III rapids such as Center Rock and Surfing Rapid. The River has chutes, drops, and large holes that challenge both the guide and guest alike. 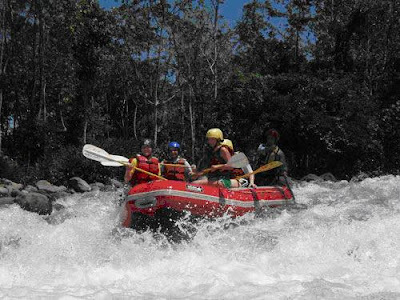 Whitewater rafting is not like a one in the theme park – it’s a river; there’s no lever that makes the ride control/stop …The ride down the rapids was intense. As the water smashed against my face and I missed the surf, I became more and more comfortable with the frightening situation. It’s a life time experience man!!!. I just can’t expound the excitement in words!!! After some 7-8 miles of intense, the water became slow and soft like a lake. We got down from the raft and tested our swimming skill for some time. Jumping from the Rock, Lunch at middle of the River, Motor driven chained-raft ride…. All made the trip spicy and exhilarating!. Our guide was an expert, who carefully headed to make the ride both safe and exciting. It was nearly 15-20 miles of pure adrenaline, yet I still found the time to look up and enjoy the breath-taking scenery that surrounded me. After a day long adventurous rafting, we were tired and wanted to spend the evening coolly. We headed towards the Cumberland falls, with all our cameras filled with Charge & Memory. Cumberland Falls, sometimes called the Little Niagara, the Niagara of the South, or the Great Falls. It’s a 130-foot wide curtain of whitewater that pummels 68 feet into the Cumberland River. The falls, River and the surrounding areas are vey scenic and Impressive. We’re shooting all angles of the falls till the camera battery drained out. One thing special about the Cumberland falls is “The Moon bow”. On a clear full moon night, the mist of the Falls creates the magic of a Moon bow. Cumberland falls is the only one place in the western hemisphere to see a rainbow produced by the light of moon. We’re unfortunate to witness the Moon bow and returned back to our Camp. We tried rock? Climbing; made a camp-fire in front of our Inn; Chatting over topics, Politics to Economy, Sports to Cinema… the evening just swept off. It was time to Geo-caching. We were taken in a wagon into the deep of the forest. The trip was full of natural scenery, where the stream dropped down to a series of waterfalls, called as “Triple Falls”. Indicating the navigation signals, our guide dropped us in the mid of thick forest and left the place. We had to come back to our net, by exploring the “caches” over the path. We just walked into the lovely green- wet forest with no clear goal in life but to enjoy the surprises thrown by the forest trek. The most memorable part was the waterless waterfall :D! Memorable for the people slipping on the rocks and bruising several body parts in the process. Horse riding had been a dream for me for many years; and this trip full filled that too. We experienced the thrill of Horse riding too. All said and done. 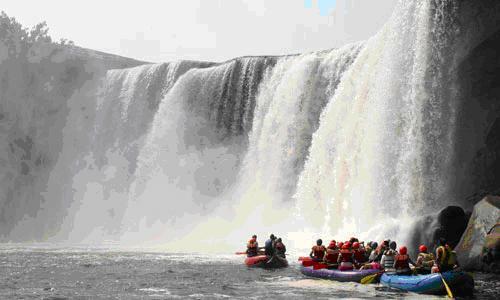 Imagine a beautiful waterfall, rafting in the middle of a dense forest… life rocked! Having played and fallen enough, it was time to get back. A good happy two days spent, I must say.